Vatican Erases Its Official Record: Pope Francis Didn't Mean To Suggest That Gay Kids Need Psychiatric Help - Joe.My.God. The Vatican has rolled back on a recommendation by Pope Francis that parents seek psychiatric help for children who show homosexual tendencies. The pope made the comments to journalists as he was flying back to Rome from Ireland, but the Vatican later removed his phrase from its official account, saying he had not meant to suggest that homosexuality was a mental illness. When asked why, a Vatican spokeswoman told AFP it had been done in order to not “change the thoughts of the Holy Father”. 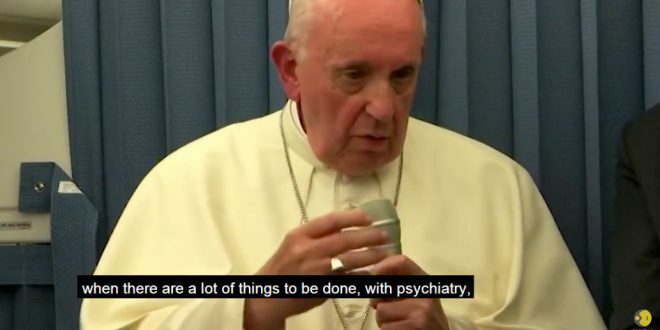 “When the pope referred to ‘psychiatry’, it is clear that he was doing it to highlight an example of ‘things that can be done’. But with that word he didn’t mean to say that it (homosexuality) was a ‘mental illness’,” she said.